Since the Internet of Things boom, there are a ton of devices you can use to monitor just about every part of your home. Canary is one such gadget, designed for home renters to place anywhere in their house to track air quality, movements and sound while they’re away. It just so happened that the Canary offered a review unit for me right before I departed for a month-long trip to Europe and Asia. Here’s what happened in the past two weeks. The Canary is about the size of a spray can, with a nice aluminum finish that doesn’t retain finger grease should you pick it up and move it around often. To sync the device to your home’s Wi-Fi network, all you have to do is download the app to your phone and follow the instructions. 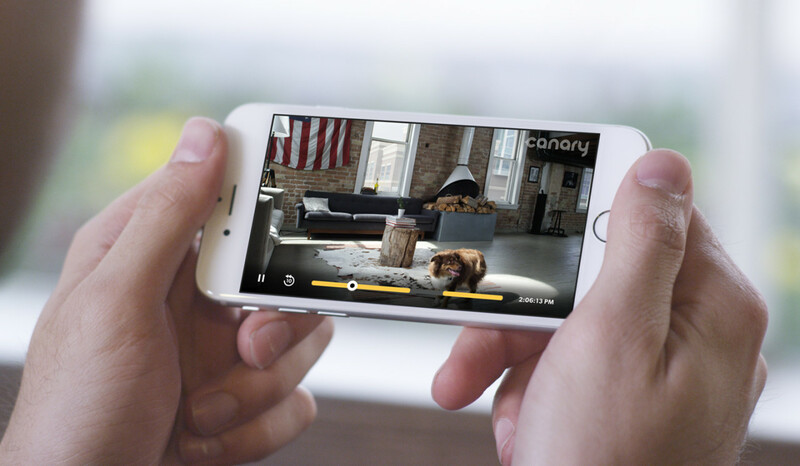 You’ll see a pretty yellow glow when you’ve successfully paired Canary to your Wi-Fi network. You can also opt to connect the Canary to an Ethernet cord, if the placement is convenient. Mine was not, so I went with the wireless route and placed it on my TV stand, facing the living room. Once connected, you can view the livestream to see a wide-angle view of the room (there are a few seconds of delay, but nothing dramatic). The 1080p picture is crisp and clear – I was even able to see the brand of chips sitting on my snack table (but I’m blocking it in the screenshot below). You can use the camera’s 3X zoom to pinch and see details of the room, though. The micro USB cord provided with the Canary, however, is laughably short with just an inch or two of wiggle room. The device requires being connected to USB power at all times, so you might want to find a longer cord if you’re placing it higher up. There are three modes on the Canary: Armed, Disarmed and Privacy. 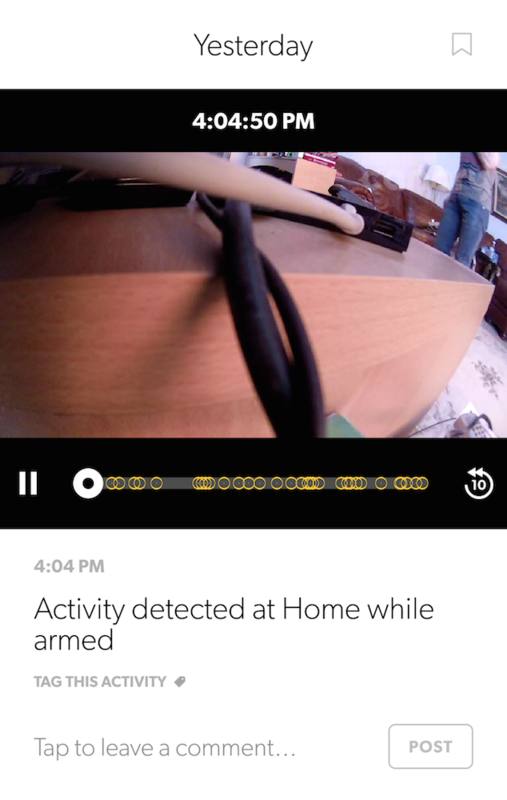 Armed means you’ll get a mobile notification each time the Canary detects something unusual while you’re away, and send you a video clip of what it saw. 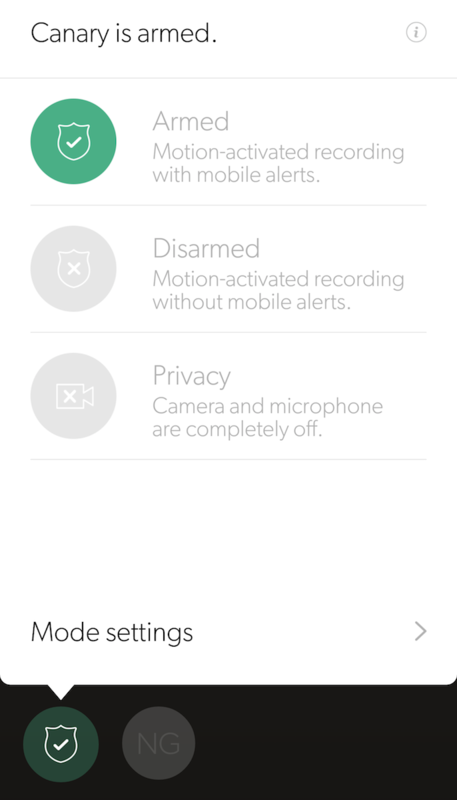 Disarmed means it can still detect the motions as before, but will not send you alerts. Privacy is designed for when you are home and do not want the Canary recording you. And boy, do you want to stop these alerts from popping up. In the 24-hour span between the departure to the airport to my arrival in Amsterdam, the Canary managed to send more than 15 alerts from movements within a 30-minute span. Still, it was rather comical seeing them stroll into the room, not even noticing the device. I’m almost hesitant to describe how the Canary looks so that high-tech intruders won’t be able to try to spot the device and disconnect the USB. A day later, I launched the Canary app to check in on my apartment to find that the device has been knocked over because of the short USB cord. I called my housemates to remedy this, and the feed resumed. No notifications, no alerts. Even when I knew for a fact that someone was coming over to my house, and the Canary would still be in Armed mode. Whenever I attempted to watch a livestream of my apartment, it also took extra long to load the video – sometimes not rendering any image at all. Other times, it’ll say the device is offline completely, but never sent an alert to say this happened. I began to wonder if my Canary had been accidentally disconnected again, but my housemates assured they even used a longer USB to connect to the device to ensure it wouldn’t fall over. A week later with no notifications, I woke up to another flood of alerts – similar to the first time I received them. A series of short videos in night vision mode of nothingness in a span of 20 minutes. As one does when they experience something unusual, I googled my Canary’s symptoms to see if others are noticing similar problems. Sure enough, a few other users note the hyper-sensitive camera, random offline statuses and inability to stream live. However, it all seems to stem from a software issue, which I hope is fixable in an update. Other than the issues experienced, I also wish the Canary had a timer function that recognizes when I headed to bed so it would switch itself to Armed mode. Although I wasn’t home to live with the Canary, I imagine I won’t always remember to switch the modes each night before bed (automation is the name of the IoT game anyway). Overall, I think the Canary home security hub is a great concept, but needs a little more work before it can really take off. It’s got potential to help home renters like myself get home security monitoring with just one, affordable gadget, but at the moment, it feels like I’m using a beta prototype of the product. If you’re interested in purchasing the Canary ($249), I would recommend it – but perhaps in a few months after the team’s able to make the updates you see fit for your lifestyle. Oh, and a longer USB cord please.